The iFLEX-iRIS CDRH compliant interlock remote with power supply unit is recommended for general laboratory use, and complies with CDRH regulations. 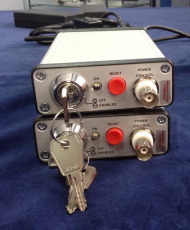 It includes a laser safety keyswitch (with 2pcs keys) and a laser safety interlock plug, plus LED indicator to show laser emission status. It is provided with a power supply. Please note that a standard IEC power cable must be acquired separately. This can easily be purchased locally to match your local power plug requirements.